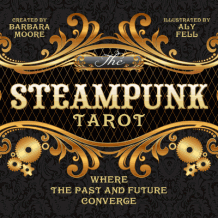 The Steampunk Tarot, by Barbara Moore and Aly Fell (pub. Llewellyn, 2011) video reviewed “out of the box” by Marcus Katz. In this “straight out of the box” review, Marcus discusses Steampunk, gears, Babbage’s computer, reveals what his brother does as a living, provides a “Difference Engine” spread to investigate the deck, talks about shuffling and alludes to a terrible joke about four candles. The book and deck are reviewed in terms of their wonderful artwork, “elegant imagination” and for providing a shift of perspective beyond any merely novelty use of the Steampunk theme. Barbara Moore will also be presenting her deck at the excellent Steampunk event, TeslaCon3, November 30th – December 2nd, 2012. 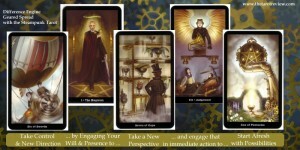 Discover more at www.steampunktarot.com or buy the deck at Amazon. The joke about Four Candles can be viewed in its entirety on YouTube here. That was fabulous. I love the idea of reviewing out of the box. I was scared, though, the whole time waiting for you to find something that you hated so much that you couldn’t hide on camera. Whew! Lucky that didn’t happen. I laughed when you tossed the white box/spacer. I have been begging Llewellyn to stop doing that. Maybe I’ll show them this. The conversational pieces you mention are known in the gaming world as “flavor text.” As a former gamer, I could not resist having a valid (more or less) excuse to include this little nugget of fun. Flavor text is a line that is included on gaming cards or in rule books that doesn’t really have any bearing on actual play but instead adds flavor or characterization to the experience. While traditional flavor text does not usually include anything of importance, I crafted my flavor text to tie in with the card meaning. I was on pins and needles when you mentioned the Sherlock series, because I’ve not seen season two yet! Thank goodness you didn’t give anything away. I created several spreads for the book, and a few of those have “moving parts” and one is called the Difference Engine (just like yours! ), but it is, of course, different. I really did love yours, though, and have to try it myself. Near the end you talk about how a project like this could go horribly wrong. Trust me, I had that fear about it, too. Thanks for the fun review! I loved seeing you meet the cards! I absolutely loved this video review. I enjoyed watching your first responses to different cards. I like your idea of reading the book as a book then going through the cards to see where your mind will make certain connections. I agree with you about the need for more dialogue about shuffling. My cards also cringe when someone attempts a fancy shuffle. My cards cringe then I gently reprimand the abuser. This gentle reprimand is usually, “What the hell are you doing to my cards? !” Since it is mostly family that I read for, I don’t mind being so protective…of my cards! Well done! I look forward to more reviews of this type. 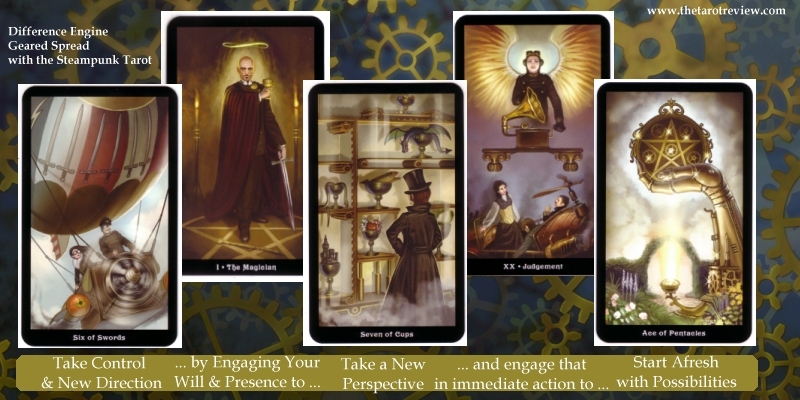 I have been waiting for my copy of the Steampunk Tarot to come in, and your review made me want to rush to the post office to check if it is in yet. I really liked seeing that it’s okay to put the book aside and go with your guy feeling first. Usually I do it the other way around by reading through the suggested meanings from the author, and then seeing if I agree or disagree and why. It takes me a long time to actually digest the meanings and play with the deck, but I figure I could try it the other way around this time. The world of Steampunk is full of magic, and that magic is more spontaneous than anything. I got the sense of mood and movement with the lighting, even though the objects in it are static. For example, I can picture that gigantic hand coming out of the ground in the Ace of Coins and offering it to the viewer. Magic! Very nice review, glad you made the time for it. Wonderful review of (what seems to be) a wonderful deck; I really liked that ”out of the box” approach a lot. 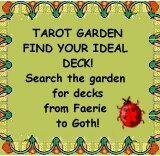 Just ordered from Tarot Garden and can’t wait to receive it. Thank you for the “out of the box review”! Loved the material. Great deck of cards, would love to have this deck! Thanks for taking the time to do this.. and Please, do it again in the future! I very much enjoyed this out of the box review and I too enjoyed the tossing of the internal spacer! I pick up my deck on Friday and I am all the more looking forward to it now after watching this review. Great way to do it, would love seeing more of these in the future! I also really liked the spontaneous Difference Engine spread and am looking forward to trying it out myself. I was NOT going to buy another deck. This excellent review changed my mind. Heading over to Amazon. Great job, Marcus! I loved this review! Can’t wait for mine to arrive this week. 🙂 I especially loved your gear spread!! Great review! I really enjoyed the “out of the box” review with the on-the-spot new spread. I just ordered this deck and I am VERY excited for it to come. Thank you for taking the time to review this deck. what a great idea for a review. Very much in tune as well, sitting in front of my black mirror watching you from a far. Fun and rich in content, as all you do. Barbara, what a Great Deck! This will go straight into my reading room, as well as any RPG/LARP I am up to. I can imagine Count Brass carrying a set of these to the towers of Londra to read the fortunes of Dorian Hawkmoon and the Runestaff. You so hit the theme without bending sideways. Markus, thank you! I’m so glad you like it. And I know Aly will be pleased to hear it, too. He’s not much of an online guy, so I’m passing along all the compliments. It has been so long since I gamed. Hearing even just that one sentence of yours makes me want to again. I’d love to hear some of Count Brass’ adventures with the cards! Thank you Marcus, for such a thoughtful and in-depth first impression review. I too, very much like this deck for all of the reasons that you state. What moreso impressed me was that the companion book was very well written. A student of English literature would enjoy reading it as Barbara has a very nice, eloquent turn of phrase. You don’t often get that in a book on tarot and as such, it’s fast become a favourite of mine. Thanks to both you and Barbara! What a brilliant review. I really enjoyed it. It was useful and I discovered that d get these cards, based on the images and the book, and having seen them in use.